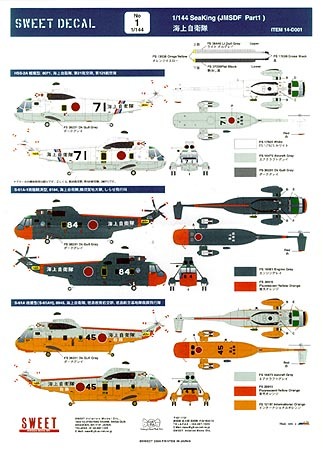 One Seaking kit and 3 aircraft markings included. #14-D001 Description Snap-Tight kit; The new, Snap-Tight kit of 1/144 scale H-3 Sea King Helicopter. 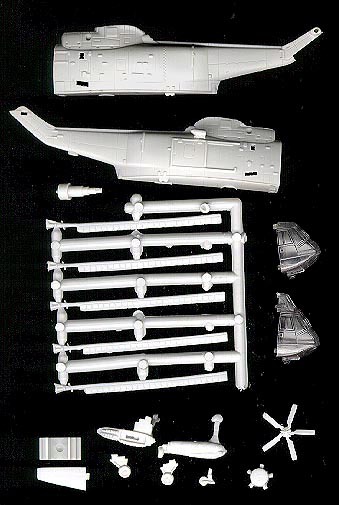 The snap-tight kit consist of 17 white injection plastic parts and 2 optional clear parts for different nose section. All panel lines and window frames are recessed. Model Lengh: 6 & 1/4" when it's built. 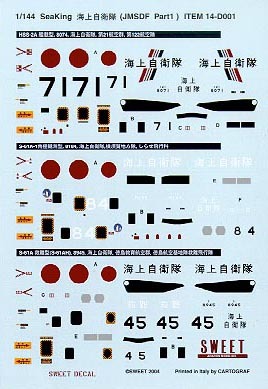 Decal Sheet; The decal depicts 3 aircraft markings from Japanese maritime Self Defense Force; HSS-2A (Ship Borne Type,) S-61A-1(Antarctic Research Expedition,) S-61A (Rescue Type.) High quality decal printed in Italy by CARTOGRAF.